Hurricane Irma did some major redecorating in my backyard. I can’t say I agree with her mulching technique (scattered all over the lawn). She stripped the leaves off most of my plants. Thankfully she left the oak tree standing. 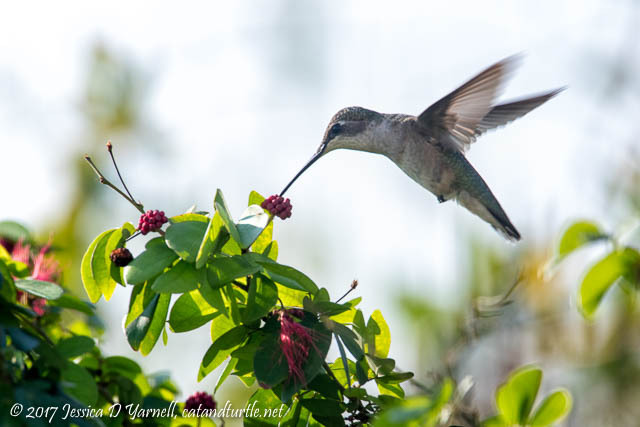 Irma also left us with a few tiny surprises: Ruby-throated Hummingbirds. 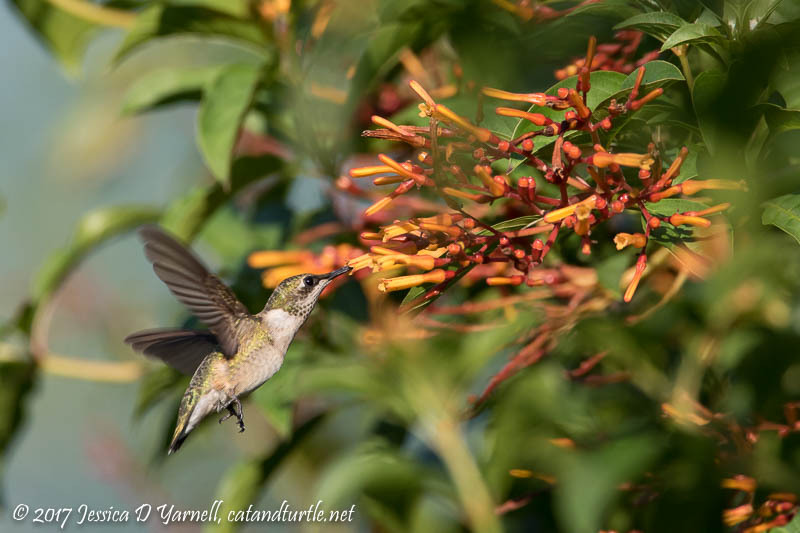 They have been such a joy to watch in the backyard each evening as they zip around, nectaring at the firebushes and chattering with each other as they fight for the best blooms. 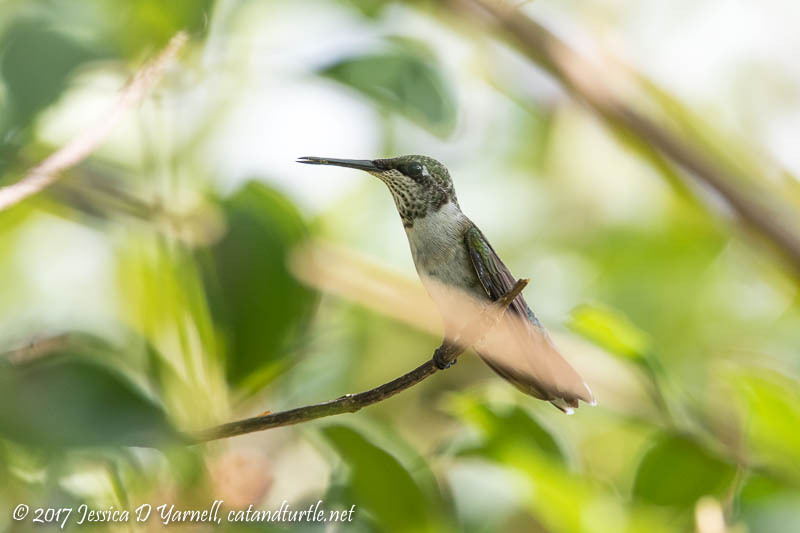 If you read my latest posts, you already met the little female hummer. A day or two after the storm, we named her Irma. Imagine our delight when we realized that Irma had a friend. A gorgeous male with his flashing red gorget. He has a tendency to hog a plant and sit on it, so we continued the hurricane naming trend and called him Harvey. Harvey doesn’t like to have his picture taken and only let me grab a quick snapshot. 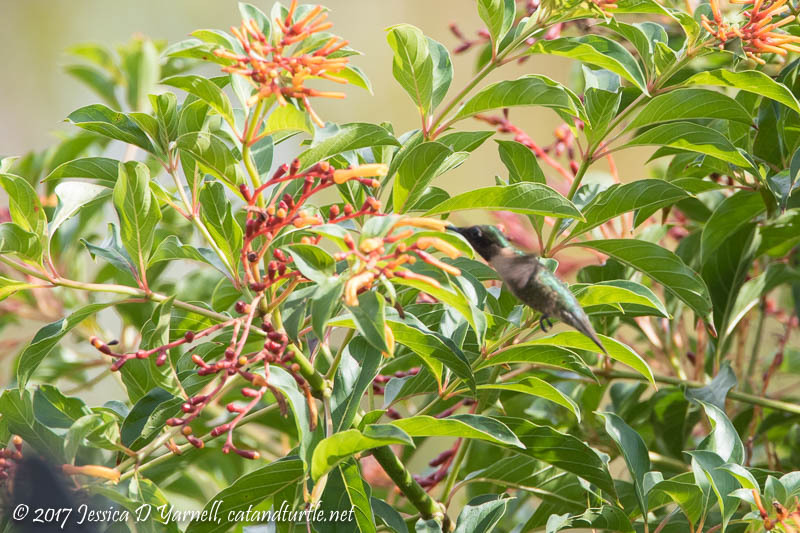 Then one afternoon we looked out and saw not two, but three hummingbirds nectaring simultaneously. The third bird was a juvenile male. His throat is just starting to turn red, and he proudly flashes his tiny spot of color. His nectaring tends to be erratic, especially when Harvey chases him in circles. So after watching several flight loops, we named him…you guessed it…Jose. Jose is very camera-happy. He didn’t mind a bit when I introduced him to the Beast. In fact, he’ll hover over my head when I am outside working. The whir of his tiny wings overhead is pretty neat. Jose is by far our most active hummer. 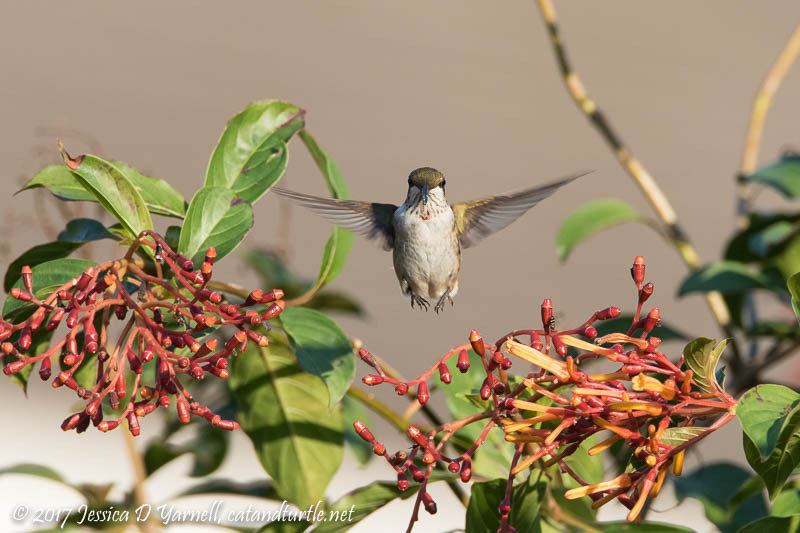 After photographing him on several occasions, though, I realized that I had two young males. The first has more of a bib under his chin already. So we dubbed him Lee. 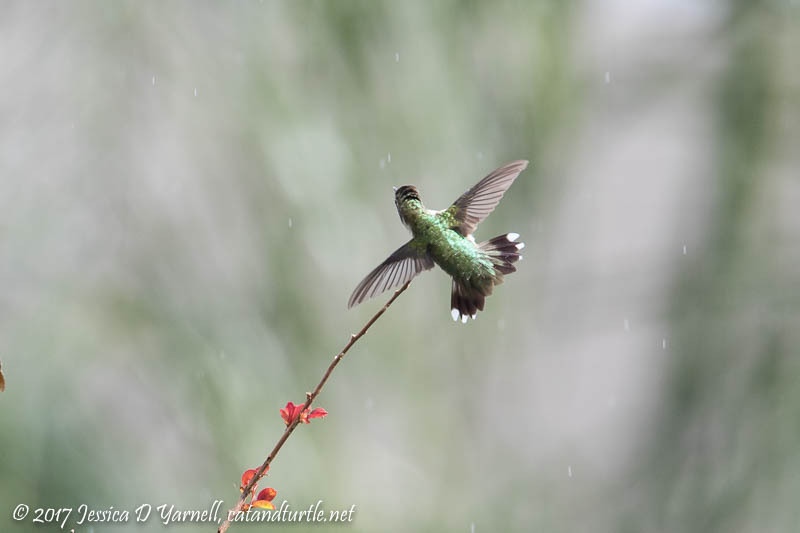 We’ve had some rainy afternoons lately, and that seems to be the best time to find the hummers. They delight in the raindrops. And now I know where my hummers went, LOL! My huge firebushes took a hit and the birds left me and the feeders behind. But they always come back. I enjoyed the photos.